Ken Johnson reviews the 2015 International Show, selecting our early Tiffany transparency as one of the eleven highlights of the fair. Lillian Nassau celebrates its 70th Anniversary in 2015. Arlie Sulka visits Flagler College with Antiques Roadshow to discuss the college's famous interior designed by Louis C. Tiffany. 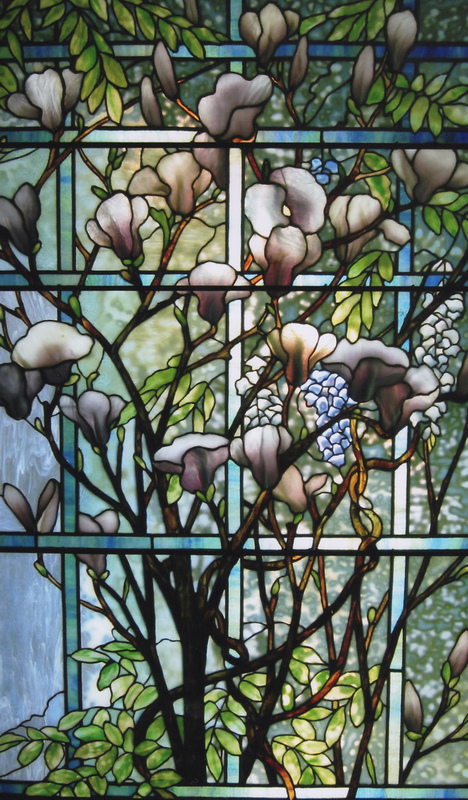 Roberta Smith covers the International Fine Art & Antique Dealers Show, highlighting Lillian Nassau LLC's "showstopping" Tiffany Studios leaded glass Magnolia and Wisteria Window. Eve Kahn discusses the Museum of Biblical Art's new exhibition on Louis C. Tiffany and the Art of Devotion, including the Antependium Window lent by Lillian Nassau LLC. Eve Kahn discusses the Nassau County Museum of Art's “The Paintings of Louis Comfort Tiffany: Works From a Long Island Collection” containing several pieces from the gallery's collection. The Museum of Biblical Art's exhibition Louis C. Tiffany and the Art of Devotion is discussed, highlighting our San Andres mosaic and Antependium Window. 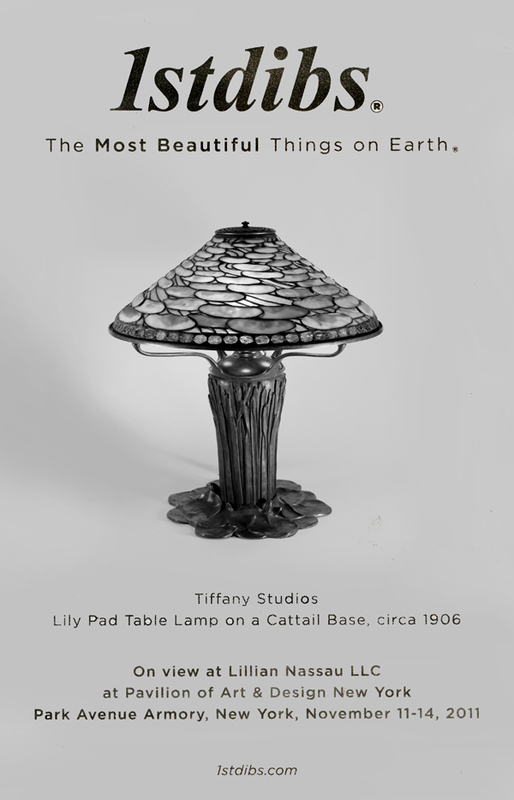 The Art Fair Company asks Metro Show dealers, “If you had to select just one object to submit to a Top Ten list, what would it be?” See their responses, including Lillian Nassau LLC's Tiffany Studios Lily Pad Table Lamp. Click here to read more. Arlie Sulka discusses Lillian Nassau LLC's participation in the inaugural Metro Show. Be sure to pick up the Monday, November 7 2011 edition of The New York Times to see the 1stDibs ad for the upcoming PADNY show featuring our Lily Pad Table Lamp on page A3. 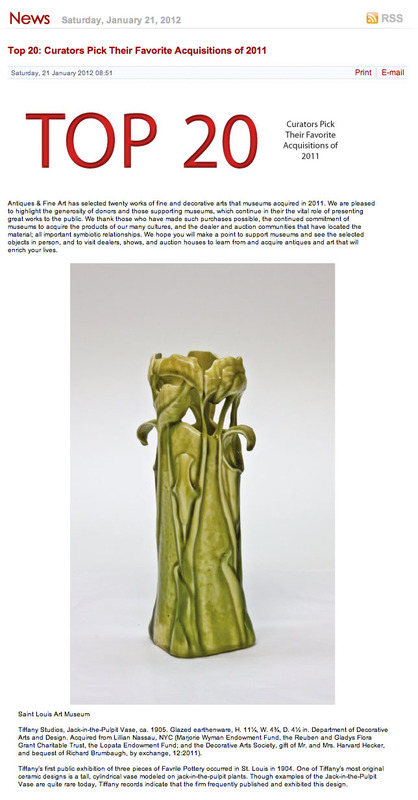 Antiques & Fine Art News has selected twenty works of fine and decorative arts acquired in 2011, including the St. Louis Art Museum's purchase of our Tiffany Studios Favrile Pottery Jack in the Pulpit Vase. Click here to read the article. Eve M. Kahn discusses Tiffany Studios mosaics including references to mosaics at Lillian Nassau LLC as well as new acquisitions at the Metropolitan Museum of Art. NY1 speaks with Arlie Sulka at Lillian Nassau about a stained glass Tiffany window recently discovered in a Flatbush Public School. Art historians Gwen Wright and Nina Gray visit Lillian Nassau while tracking down an elusive stained glass window by 'Tiffany girl' Anne Weston. Matthew Palm of the Orlando Sentinel speaks to Arlie Sulka and covers the Morse Museum expansion and opening. Palm Beach Society Magazine features Lillian Nassau's Tiffany Studios orange tulip table lamp on a telescopic base. Eve Kahn, New York Times writes on Tiffany Favrile Pottery. Eric Silver discusses the benefits of saving those seemingly valueless but sentimental items. Excerpt from Eve Kahn's article on Tiffany and more entitled "Downsizing Dealers Drumming up Sales", New York Times, December 3, 2010.